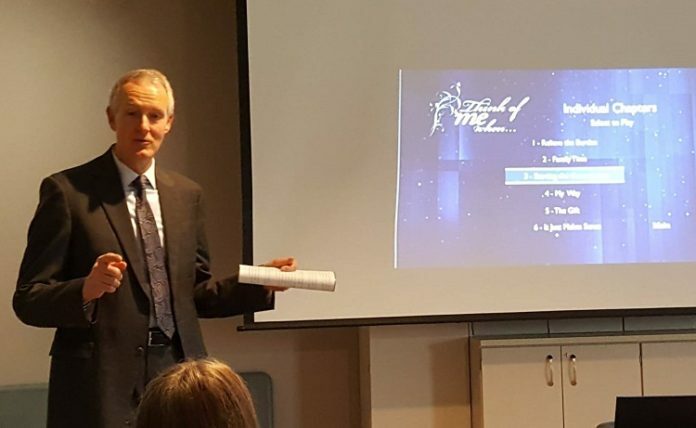 Marcus Carris of the Carris Family Funeral Home and Cremation Care spoke March 25-26 at the Perry Public Library and again April 4 at the DCARSPA meeting. 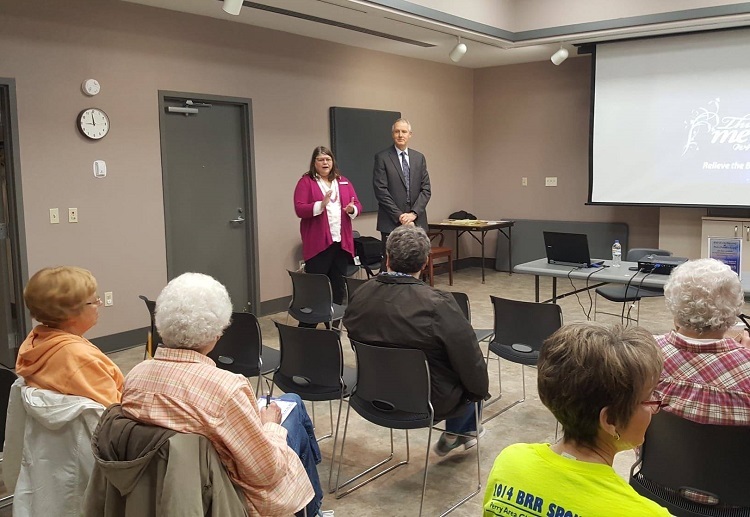 Marcus Carris, standing right, of the Carris Family Funeral Home and Cremation Care spoke March 25-26 at the Perry Public Library and again April 4 at the DCARSPA meeting. Perry Public Library Director Mary Murphy, standing right, introduced Carris. The Dallas County Area Retired School Personnel Association (DCARSPA) continued their theme of “Celebrating Our Successes” by welcoming Marcus Carris to their April 4 meeting. Carris described for the group how he went from farm boy to funeral director. After graduating from high school in 1981, he explored several options before settling on mortuary science as a profession. Following employment at several funeral homes, he returned to Perry in 2001 and opened Carris Family Funeral Home. Marcus and his wife, Mary Carris, expanded their services in 2018 and marked the change with an expanded name. They are now called the Carris Family Funeral Home and Cremation Care. Carris presented much helpful information for individuals in preplanning their final journeys in ways that relieve their survivors of stress and guesswork. Many decisions must be made in arranging final arrangements, he said. Carris said he deems it a great honor to touch the lives of many people who touched his own life in the past. He told a charming story about making funeral arrangements for a woman who for many years had driven the school bus that he rode to school as a boy. He was pleased to think he could return the favor and give her her final ride. Death can be difficult for the survivors of loved ones to endure. Even the propsect can be daunting, as Carris related in a humorous story about a couple who purchased their headstone in advance of their death. Their children could not bear to hear their parents talk about it or describe it, and they certainly were not going to visit Violet Hill to see the stone. Carris’ DCARSPA presentation followed closely on the heels of a two-day End of Life Planning program held March 25-26 at the Perry Public Library. The free sessions also offered practical information and thoughtful advice on the process of planning for the end of life.